These stylish tanks are perfect for all of your favorite warm weather activities. 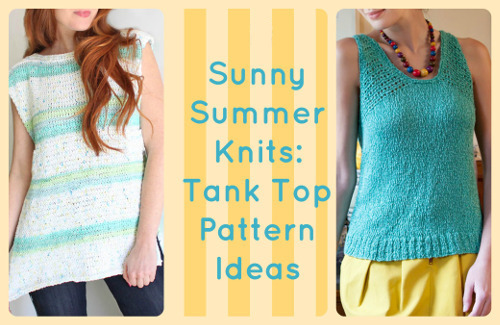 Try these 16 Sunny Summer Knits: Tank Top Pattern Ideas for summer knitting projects. Wear the Blue Crush Halter Top for a day at the beach or lounge poolside in the New Cotton Top. Wear the Sleeveless Summer Top as a cute bathing suit cover up. Try these tank top pattern ideas and knit a lacy top for a little bit of flirty fun. Cutout lace patterns let you feel the warm summer breeze in these cute summer knits. Don't let the heat stop you from knitting under the sun! Lighter and worsted yarns make airy pieces to help you cool off in the summer. It's never too hot for knitting! Use threads with fresh colors and whimsical hues in any tank top pattern to bring out the sunshine. Your favorite hobby doesn't have to be put on hold because of the rising temperatures. Add some shimmer to any tank top pattern with some bright yarns and get your summer shine on! Love these tank top pattern projects? Get more summer knits in the Knitting Free Patterns for Summer: 7 Sizzling Knit Tops, Knit Sweater Patterns & More eBook! These tank top pattern ideas may keep you cool, but these summer knitting patterns are hot! Knit tank top pattern designs are making a comeback with upscale urban fashionistas. Use your classic hobby to keep up with the hottest trends. Capture the bohemian spirit of today's most popular styles with these summer knitting projects. Add your own pretty details to these inspired summer knits to make them your own, or keep them as is if you adore the pattern enough already. For more lovely tanks like these, take a look at our page, How to Knit a Sweater or Top for Any Season: 305 Free Knitting Patterns! We love how light and lacy these tanks are. The lacy pattern means you might need to wear another shirt underneath, but it's completely worth it for the gorgeous, airy designs. They also work as fantastic swimsuit coverups out on the beach, so knit a few up for your vacation! Each lacy tank top pattern here isn't just for the summer; they're just as wonderful in the spring underneath a cardigan or alone on the warmer days, so don't feel restricted.